Move through Zoho Expense and get the hang of it in no time! Just a few simple steps. Before we get into each module, here's a quick look at it as a whole. The Navigation panel on the left hand side lists all the modules of Zoho Expense. The Quick Create button right by the respective modules is the shortcut to create new transactions. 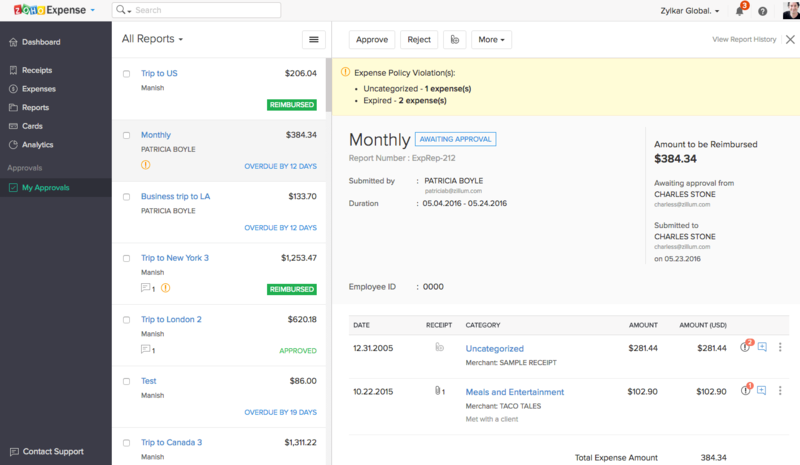 Use the Search bar to find a specific expense, expense report or more. Click on the settings icon to manage your Organization Profile, subsriptions and more. Know Zoho Expense better by attending our webinars, or get in touch with us through the Support option. 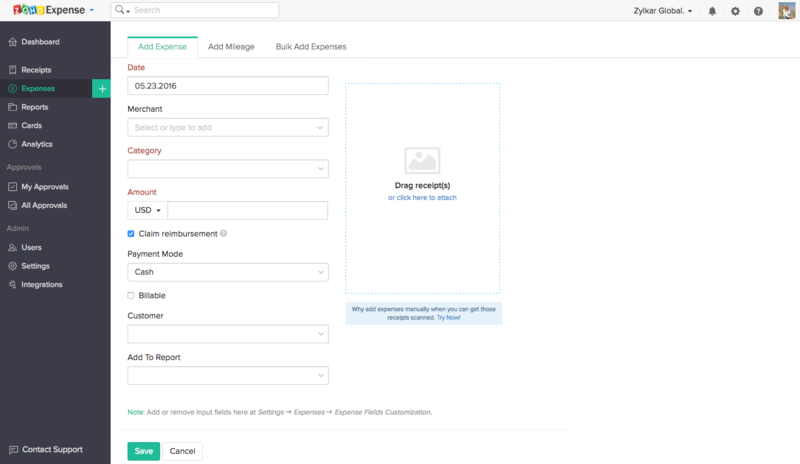 Learn how to upload a receipt in Zoho Expense. Click on the Receipts section on the LHS. You can drag receipts and drop them on the screen. 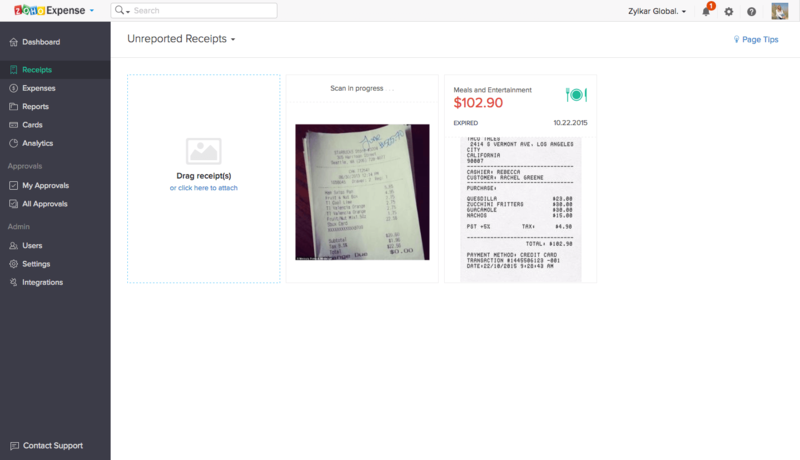 You can also browse from your computer to upload receipts. Your receipts are auto scanned to create expenses. You can upload multiple receipts at the same time(upto 20). Here's how you manually capture an expense. Click on the + icon right next to Expenses. 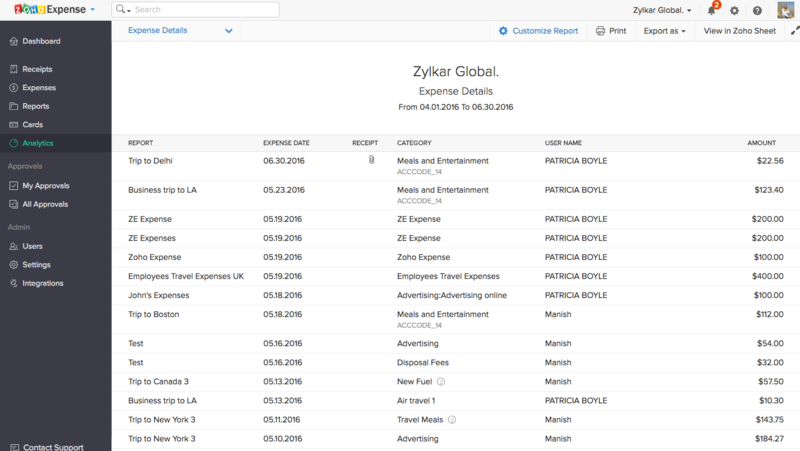 Enter the expense details in the New Expense page. Enter other details like Merchant name and Description. Add a receipt if needed. Add the expense directly to an expense report. Learn how to quickly add your credit card and import card transactions in Zoho Expense. Click on Cards on the LHS. Click on +Add Personal Card. Choose your credit card from the options listed or enter it manually. Enter your credentials and click on Submit. Learn how to create an expense report and add expenses to it. Click on the + icon right next to Reports. Enter details in the New Report page. Enter other details like Business purpose and Submit to. Include expenses that have been already created. Create a new expense in the same page. Click Save and Submit to save and instantly submit the report to your approver. Set up basic preferences and company policies for expenses. Click on Settings' on the LHS. Select Expenses from under the Preferences section. Set up the currencies for recording expenses. 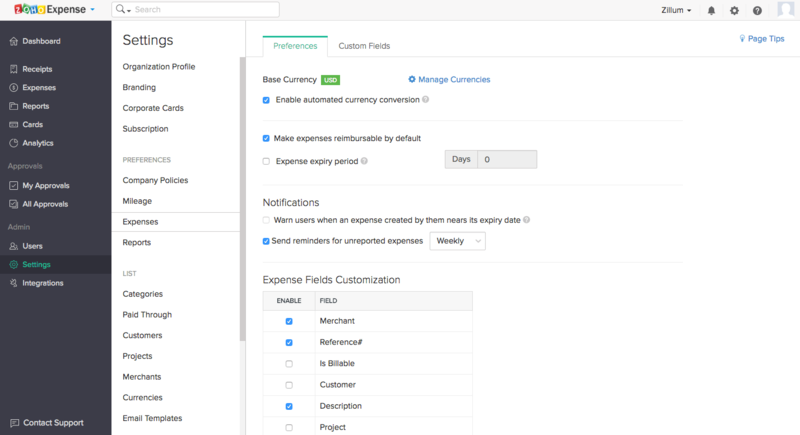 Add custom fields to the expense creation page. Set up Notifications for expenses. Learn how to approve/reject and reimburse expense reports. Click on My Approvals on the LHS. Select an expense report to approve or reject. You can either approve or reject the report. You can also Forward the report to another approver without approving or rejecting it. Post a comment on the expense report if needed. Once a report has been approved, it can be reimbursed. Connect with your staff and colleagues. Click on Users on the LHS. Invite User button allows you to add more people to your Zoho Expense account. Enter the User's name, email address and select a user role. Generate reports on expenses to have better visibility into your expenditures. Select Analytics from the LHS. Select a particular report from the left pane. Customize the report to suit your requirement. Print or export the report as PDF. 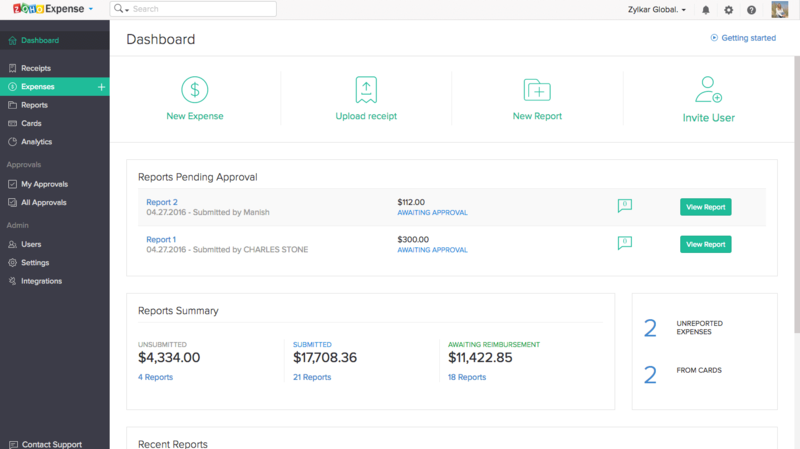 Learn how Zoho Expense helps with your expense tracking, management, and reimbursement. How many employees will be using Zoho Expense?